HomePraise | ThanksgivingIt is Finished meaning. Your sin debt is paid in full. It is Finished meaning. Your sin debt is paid in full. What did Jesus mean when He said, It is finished. Video. The famous last words of Jesus before he died on the cross. He said “It is finished” and gave up his spirit. Why did Jesus say these words and what did he mean by saying, it is finished? As many of you know, Jesus came down from heaven to save sinners like you and me. “It is finished” is the English equivalent to the Greek word “tetelestai” used in the Old Testament. In Greek it means, bring to close, fulfill, to complete. It also means – will continue to be finished. God knew from the beginning that we would never be able to save ourselves. As the Bible says, we have all sinned against a righteous and loving God. But in his love for you and me, God sent his son Jesus to wipe away our sins and die on our behalf. We all have a sin debt, we owe God. No matter what we do or could have done, we can never pay this debt. 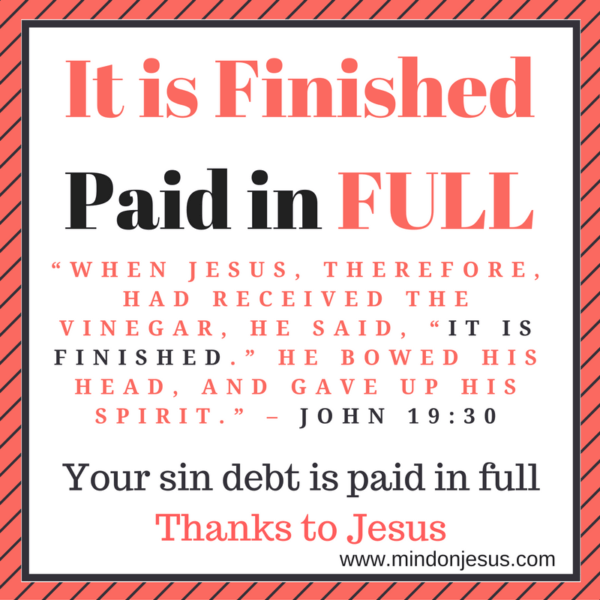 When Jesus was about to die, he said “it is finished” meaning – Heavenly Father, I have paid the sin debt mankind owes you. Jesus wiped away our debt completely and forever. There is nothing you can ever do to save yourselves. There is only one person who can save you from Gods judgement – God Himself. “It is finished” is God telling you – I have done for you what you could never do. I have erased your sin debt and have reconciled you to myself. This is grace, as the Bible says “by grace are you saved through faith”. Through faith meaning? It means you have acknowledged that you cannot save yourself and have put your faith in Jesus Christ alone to save you. So remember the next time the devil tries to bring up all your sins and accuse you and tells you that you are not good enough, say the last words of Jesus – It is finished. He has paid the full price for my sins. For those of you who are caught up in the endless cycle of works, trying to save yourselves from Gods judgment – Jesus has three words for you – It is finished. Death has been destroyed, the devil has been defeated forever, sin has been taken care of, and new life has begun. Jesus paying for your sin debt in full does not give you the freedom to keep on sinning. You still have to cooperate with God, repent and accept Jesus as your LORD and saviour and believe that He died for you. Note – God is holy and righteous. He can impute the righteousness of Christ to whomsoever He chooses, even to those of other religions who truly seek God with a pure and humble heart. We also have to start walking with the Lord and confessing quickly each time we sin. As the Holy Spirit moves in your life, you will start to hate sin and do what is pleasing to God. This is the process of sanctification and may take years depending on how much of your life you submit to God. Watch a short video on Jesus’ words: It is finished on our YouTube channel. – The power of death and the devil has been destroyed. – Your sin debt is paid in full. – Jesus completed his mission on the cross to save you. – You are no longer a slave to sin. – Your charges have been dropped. – You are free from the law of sin and death. – You are now victorious in Christ. – God’s wrath is satisfied. – Prophecies of the Old Testament, which pointed to the suffering of the Messiah, were accomplished. – The doors of heaven are open to us. – All prophecies in the Old Testament were fulfilled by Jesus the Messiah. It is finished also means – All prophecies in the New Testament will also continue to be fulfilled by Jesus, the LORD of Lords. I praise you Lord and God of all creation for sending your son to save us. Jesus, I adore you, I praise you, I thank you for finishing what you came to accomplish. Your thoughts on the last three words of Jesus? How does it impact you? Are you holding on to any idols or sins in your life? Would you say to your idols and sins – “It is finished”, and let go of them for the sake of Christ?